Meet our “Diamond in the Rough”…..our shed!!! 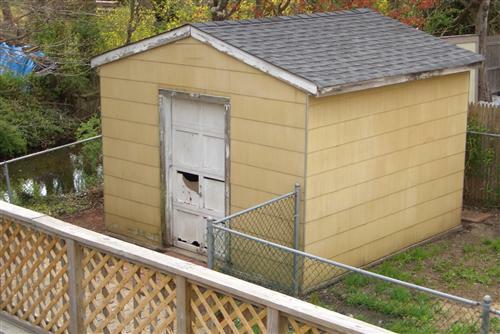 Well when we first saw this shed when we toured this house, I didn’t know what to think of it. Actually the first thought was probably to tear it down and start over again, but we had no idea what it looked like on the inside until the day of closing. The previous owners had so much of their own stuff in the shed, that we couldn’t see the walls at all. Take a look at the second picture and you will understand why we couldn’t see inside. It’s a 12×12 shed and the inside, thank god, was intact. Just needed some cleaning. Which we need to do more of to get it better organized. So this is what our shed looked like after we cleaned out the side yard. When we had the roof on the house done, the roofer did the shed also. We just had to do everything else on the shed. 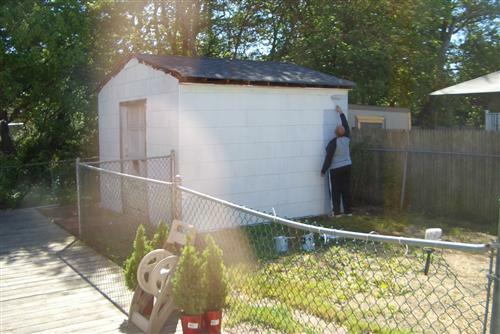 The trim work on the whole shed had to be replaced because it was rotted. We also had to replace the door on the shed. This is a garage type of door but door size. Yup you had to pull it up to get in. As you can see it had holes in it as well, so it had to be replaced. 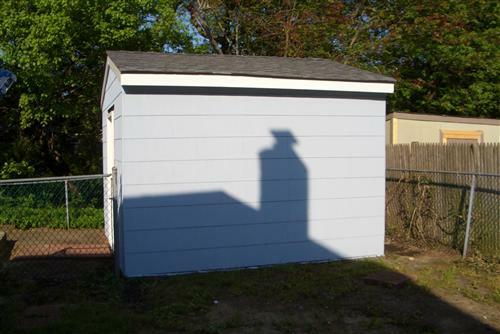 Obviously we had to paint the shingles. They were that 1980’s mustard yellow color. Yikes!!! 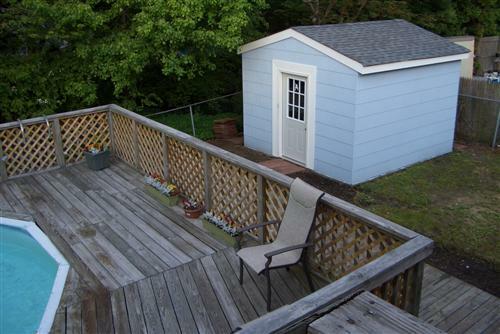 The house was sided about 10-15 years ago and we don’t know why they didn’t side the shed also. Thank god the house wasn’t this color, because that would have been a whole other project we would have had to handle. 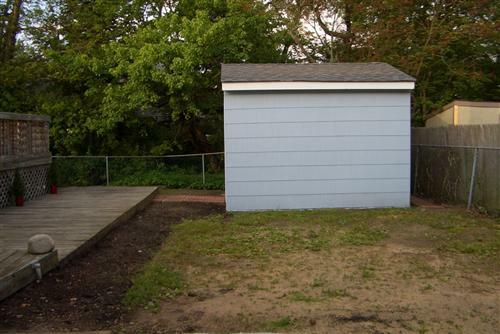 This shed is on a slab of cement so it was worth saving and making it look prettier. 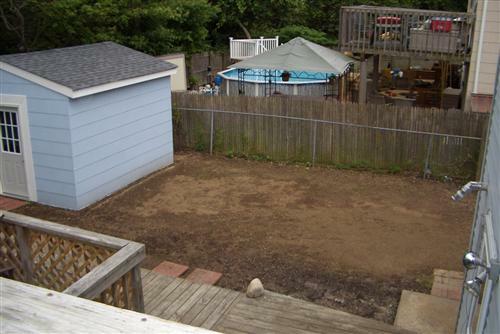 This is how the side yard next to the shed looked after all the rocks & vines were removed. You can check out the rest of that work in this post here. 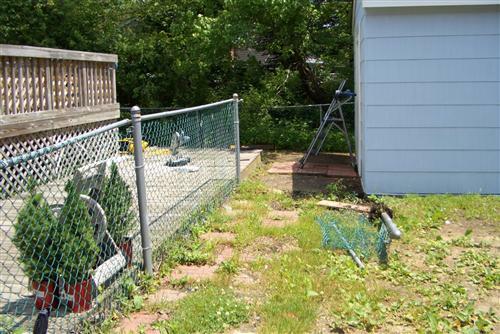 We assume that the inner chainlink fence was for the previous owners dogs and kids. We hated how it broke up the whole yard, so it had to go. 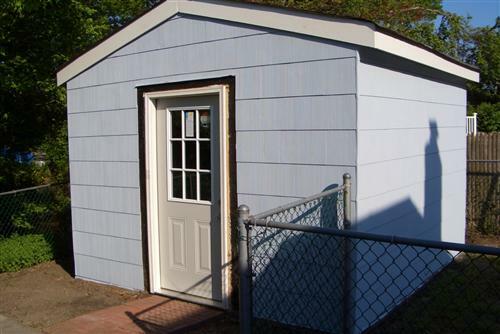 Here is the shed painted and with trim. Just had to install the trim around the door. 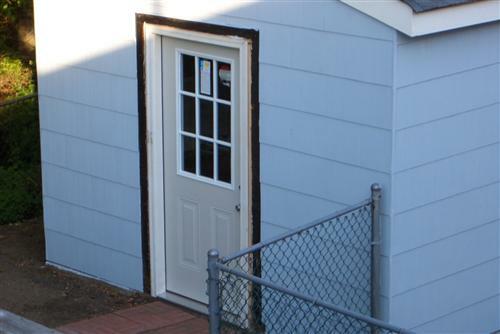 We were so happy to have a normal type of door for the shed. All the trim work is PVC planks. It was well worth the extra money for the PVC. We had bee’s that were making their homes in the old rotted wood, so we wanted to make sure that didn’t happen again. We won’t have to replace this trim for the life time that we own this home. Nice!!! Well I said the inner chain link fence had to come down & it came down. Quick & easy too. They weren’t install very well. They came out pretty easy. Score! For once something wasn’t back breaking when it came to work on this house. OMG this was sooooo much better. The yard really opened up. We weren’t enclosed into one area of the yard anymore. 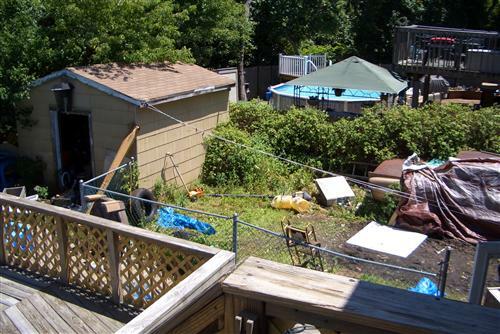 No worries, the rest of the property is fenced in completely. 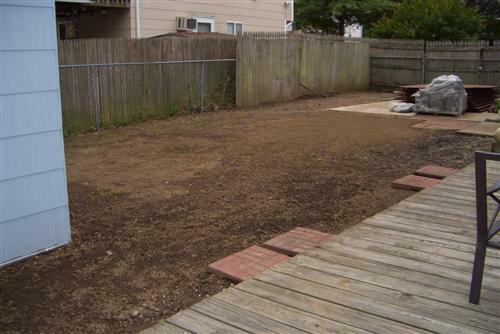 Then the side yard was leveled out for us so we could do another project. More on that soon. “Before” – Yuck…….”After” – ooh la-la!!! 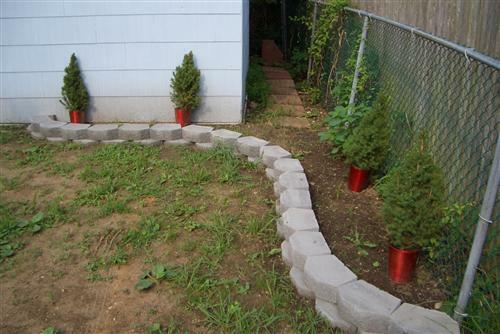 Than we moved on to making some garden beds. 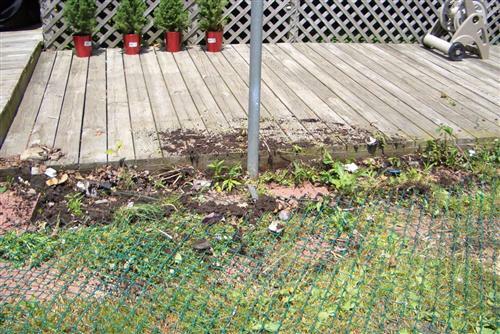 This is a very small garden bed in the corner of the side yard. We already had the small looking christmas trees, from the winter before. We bought the blocks at Lowe’s. And we bought flowers, Day Lilies and one other evergreen plant in the center. 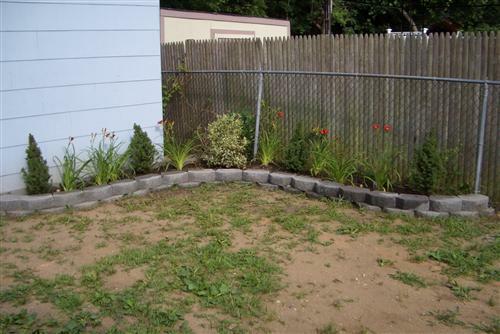 I will show you more on this area as I post more picture of the rest of the yard overhaul. So much changed in this yard over the last 4 years. It finally looks like a yard to relax in. Can’t wait to show you the big reveal of the yard.